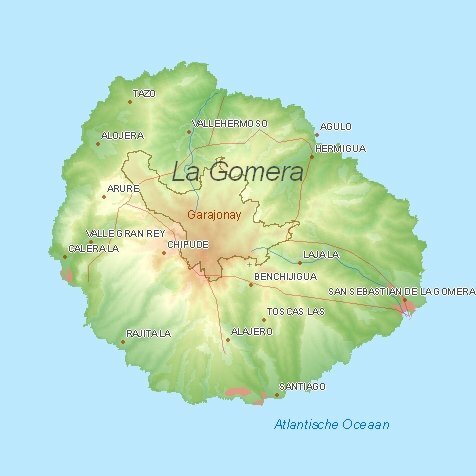 La Gomera the hiking-island of the Canary Islands. : The capital is situated at the coast of the island, the sights include the church Virgen de la Asuncion and the Torre del Conde. The town is also known for Christopher Columbus who made a stopover here to America. : In the middle of the island you can walk through the oldest laurel forests in the world. : In Alajero the only Drago (Canary Islands Dragon Tree) of the island is to be seen. : This chapel is located in the forest of del Cedro (national park Garajonay) and is frequented visited by walkers on trekking through to the interior of this green island. Soon San Sebastián de la Gomera webcam, blogs, travelreports, spanish recipes and movie locations. 1) Current weather in Tenerife_Sur (temperature, precipitation).